Flamingos are a familiar sight even to those who have never seen one in real life. The tropical wading birds have long legs with backward-bending knees, long curvy necks, and most noticeably, they are pink. We can admire flamingos or laugh at them (and often both), so we may as well learn something about them. 1. There are six distinct species of flamingo, but it takes a trained eye to distinguish them. Photograph by Charles J Sharp. 2. Adult flamingos are four to five feet tall, but only weigh between four and eight pounds. That’s the kind of astonishing body density (or lack of) needed for flight. 3. Flamingos tend to congregate in mudflats or lagoons, where they can find shallow saltwater prey. These habitats are also difficult for predators to negotiate. 4. Flamingos feed by stirring up mud with their feet. Then they reach down and scoop up a beakful of mud and water. Their beaks are designed to strain animals out of the mud, and the muddy water is expelled. This happens as the flamingo’s head is upside-down. 5. The American flamingo (Phoenicopterus ruber) is the only flamingo species native to North America, but is rarely seen in the United States anymore. It is generally more brightly colored than the Greater flamingo (Phoenicopterus roseus) that inhabits the coasts of Africa, Asia, and southern Europe. Although the Greater flamingo is the most widespread species, the most numerous is the Lesser flamingo (Phoenicopterus minor). Photograph by Flickr user Quinn Dombrowski. 6. The color pink comes from beta-carotene in the crustaceans and plankton that flamingos eat. Zoo flamingos will turn white if their diet is not supplemented with live shrimp or flamingo chow containing carotenoid pigments. 7. The feathers under their wings (flight feathers) are black. You only see them when the birds are flying. 8. 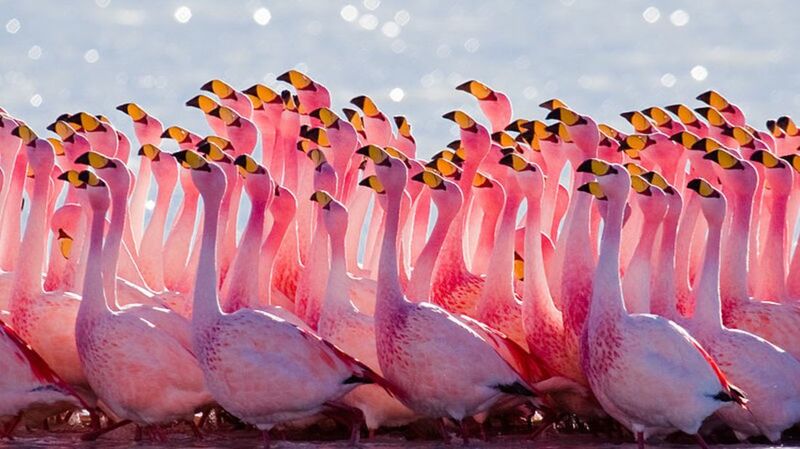 Flamingos flock in groups of up to several hundred birds. They often perform their mating displays together, like this flamingo flamenco. However, different species and even different flocks will put a slightly different spin on their communal rituals. Read about some of the individual mating dance moves. 9. The male and female of a mating pair build a nest together, and both sit on the egg while it incubates for about a month. 10. Some flamingos find it easier to steal a nest that’s already been built, so mating pairs must guard a nest from other flamingos as well as predators. 11. When a flamingo chick hatches, both parents take turns feeding it: first with a special liquid baby food they produce in their throats called crop milk, then with regurgitated regular flamingo food as the chick ages. Photograph by Flickr user Linda Tanner. 12. Flamingo chicks are born with grey and white feathers. They do not turn pink for a year or two. Their beaks are straight, and begin to curve as they grow and mature. 13. A variety of land predators will eat flamingos and their eggs, but since their nests are built on swampland or mudflats, the most common predators for flamingos are other birds. Photograph by Flickr user Kim Kruse. 15. Plastic lawn flamingos (Phoenicopterus plasticus) are an American cultural icon that was introduced in 1957 by artist Don Featherstone. In the 21st century, they are considered endangered. Efforts are underway to revive the art form, and in 2009, Madison, Wisconsin, named the plastic pink flamingo the city’s official bird.